If you are looking for an adrenaline rush, check out The Blob. 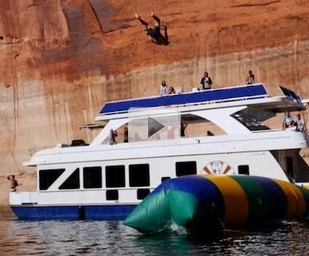 This crazed water toy gives you a rush as you are launched fifty feet in the air. With a bunch of friends, The Blob can make the perfect Saturday or even the perfect Spring Break vacation. Even if you don't have a large friend in a stylish black T-shirt as these guys do, you won't find many water toys that give you this same experience. Watch this video and see what The Blob is all about.